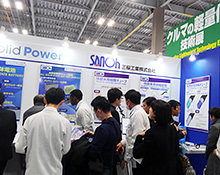 Sanoh Participates in Automotive World | Sanoh Industrial Co., Ltd.
Sanoh participated in the Automotive Lightweight Technology Expo at the Automotive World 2019 exhibition held in Tokyo Big Sight from January 16 (Wed) to 18 (Fri), 2019. 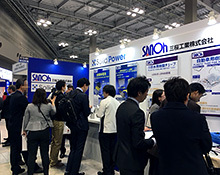 We showcased a development concept for an all-solid-state battery together with the U.S. firm of Solid Power Inc. at an exhibition participated in by automobile related companies from around the world. Many visitors stopped by our booth at the venue. They had an interest in our environmental issue-focused products and efforts on all-solid-state batteries toward next generation automobiles. We will continue to proactively work on R&D and to provide high quality products in the future to meet the demands and expectations of all those who we met during this exhibition.